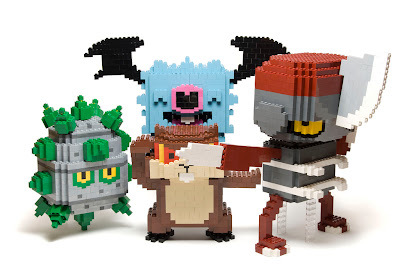 You know what really impresses me about Filip Johannes Felberg's LEGO Pokémon? I find some of them to be more attractive and interesting than their two-dimensional counterparts in Pokémon Black and White. That's especially true when it comes to Felberg's latest batch of LEGO Pokémon. I've never been much of a fan of Ferroseed and Woobat, for instance, but I'm quite fond of their blocky, three-dimensional forms. That Ferroseed is ADORABLE! I love his little green spikes. Yes! The guy who created these is pretty awesome, I've gotta say.. I agree, 2D sprite pokemon are way too mainstream, Lego Pokemon are so underground. Yeah, I don't think you really have to be a fan of LEGOs or Pokemon to enjoy these creations, Simon. I'd love to see this guy try his hand at other 8-bit or 16-bit games, though -- like SMB or Mega Man or something like that.